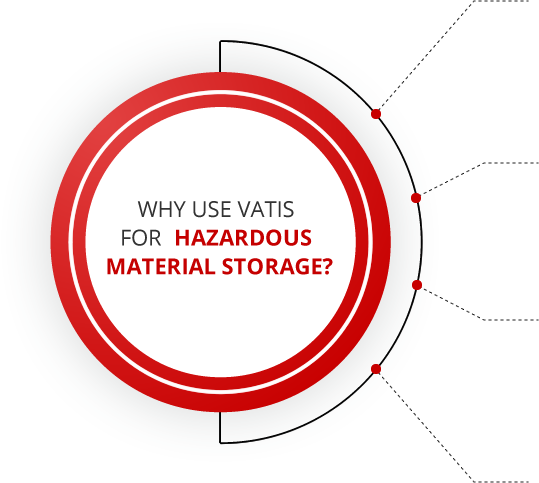 VATIS offers state-of-the-art dangerous goods storage facilities where all hazardous materials are stored according to their classification and in compliance with the most stringent national health and safety requirements. With security and safety at the forefront of our operations, we have specially trained staff and fully-accredited processes to ensure the secure storage of dangerous goods. For clients in the chemical industry, VATIS has the process disciplines and infrastructure required to provide environmentally sound supply chain services of the highest quality. We offer transformative solutions that build lasting competitive advantages. VATIS is dedicated to the safety of our employees, clients, suppliers and the communities where we live and work. We have a full understanding of the rigorous requirements that regulate the chemical and dangerous goods industry. We have a full-time compliance officer for environmental, health and safety. Storage capabilities include drums, totes, bags, cylinders, pails and cases. Inventory is managed to your exact requirements, including batch and lot control. Online inventory visibility is real-time and secure with automated management of min/max levels by SKU. VATIS integrates chemical transportation and warehousing services to maintain the integrity of your products throughout the distribution cycle. This single-source capability reduces handling, risk, and overall costs.